Douglas C. Kane reveals a tapestry woven by Christopher Tolkien from different portions of his father's work that is often quite mind-boggling, with inserts that seemed initially to have been editorial inventions shown to have come from some remote portion of Tolkien's vast body of work. He demonstrates how material that was written over the course of more than thirty years was merged together to create a single, coherent text. He also makes a frank appraisal of the material omitted and invented by Christopher Tolkien and how these omissions and insertions may have distorted his father's vision of what he considered-even more than The Lord of the Rings-to be his most important work. It is a fascinating portrait of a unique collaboration that reached beyond the grave. Kane documents the changes, omissions, and additions and traces how the disparate source materials were used to create what is in essence a composite work. 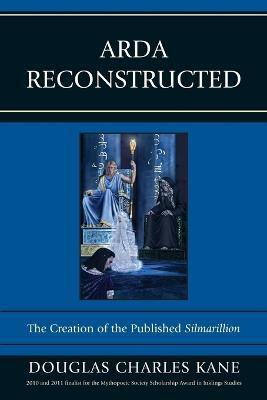 He compares the published text with the source texts contained in the volumes of The History of Middle-earth as well as other works and identifies patterns of major and minor changes made to these source materials that resulted in the reconstruction of the finished text. He also cites the works of some of the most important Tolkien scholars, including Tom Shippey, Verlyn Flieger, Christina Scull, Wayne Hammond, Charles Noad, and David Bratman in an attempt to understand and explain why these changes may have been made. Chapter 1 "Of the Beginning of Days"
Chapter 2 "Of Aule and Yavanna"
Chapter 3 "Of the Coming of the Elves and the Captivity of Melkor"
Chapter 4 "Of Thingol and Melian"
Chapter 5 "Of Eldamar and the Princes of the Eldalie"
Chapter 6 "Of Feanor and the Unchaining of Melkor"
Chapter 7 "Of the Silmarils and the Unrest of the Noldor"
Chapter 8 "Of the Darkening of Valinor"
Chapter 9 "Of the Flight of the Noldor"
Chapter 10 "Of the Sindar"
Chapter 11 "Of the Sun and the Moon and the Hiding of Valinor"
Chapter 13 "Of the Return of the Noldor"
Chapter 14 "Of the Beleriand and Its Realms"
Chapter 15 "Of the Noldor in Beleriand"
Chapter 17 "Of the Coming of Men into the West"
Chapter 18 "Of the Ruin of Beleriand and the Fall of Fingolfin"
Chapter 19 "Of Beren and Luthien"
Chapter 20 "Of the Fifth Battle"
Chapter 21 "Of Turin Turambar"
Chapter 22 "Of the Ruin of Doriath"
Chapter 23 "Of Tuor and the Fall of Gondolin"
Chapter 24 "Of the Voyage of EGrendil and the War of Wrath"